Nobody likes soggy-tipped asparagus. Keep your spears fresher longer with this quick and simple tip. To keep asparagus fresh for several days, cut off the ends and stand them upright (unwashed) in a container. Add an inch of cold water and cover with a plastic bag, then refrigerate. Refresh the water as needed. 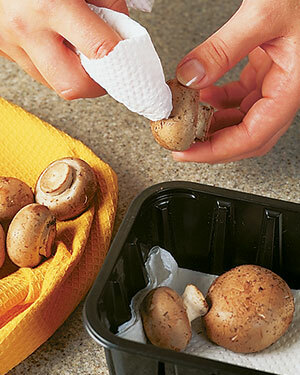 Looking for a way to clean and prolong the life of mushrooms? Look to this simple tip.